Before I developed the 7 Principles of Healing Chronic Pain, over 15 years ago, I was always frustrated that I could not help the patients who presented at my clinic in some form of chronic pain. They make up over thirty percent of all patients. Thirty percent is a figure so staggering that it is of epidemic proportions, yet I was unable to be of any real help to any of them beyond offering a prescription, and a referral for physical therapy. Neither option provided anything more than short term relief. I too suffered chronic pain in the form of debilitating migraines, tinnitus, neck and back pain. I couldn’t help myself let alone my patients. What made things worse was that there seems to be no real drive within the medical community to improve the situation of the chronic pain patient. Doctors focus on how many patients they can see in a day, not in how many they can heal. There is no focus on outcomes, just incomes. This attitude is a determining factor in patient care and it led me to make the conclusion that it is the treatments of physical therapies and painkillers, along with old school medical attitudes, that are spreading the epidemic of chronic pain. I first learnt of how the body’s own anatomy is the key to healing pain when I met medical research scientists from NASA. They introduced me to Low Level Laser Therapy (LLLT) and how effective it is in accelerating the healing processes – but the reader need not be concerned that that my book is all about laser – the book is not about LLLT. The book is all about educating the reader about why his or her body is generating pain and how to get it to stop. LLLT, also known as cold laser, is a recommended optional extra. Through the application of science, the people from NASA had found ways to help astronauts recover faster from the effects of zero gravity. They return to Earth with muscles so wasted they temporarily cannot walk and so swollen with lymphedema they are in pain. When the astronauts were surrounded with cold lasers they healed quickly. The NASA scientists by their own admission were still working on getting better results. I decided I needed to know more about the healing processes and the fact that laser light actually accelerates them, so having been a migraine sufferer for thirty years I experimented on myself. I healed, and haven’t had a migraine since. Yes migraines are curable, as is back pain, neck pain, vertigo, most tinnitus, fibromyalgia, trigeminal neuralgia, and unexplained chronic pain. I went back to medical school where I took intensive anatomy courses so I could really understand every detail of the human body, and I became adept at laser therapy. I then used that knowledge to build a true method of healing, not a temporary therapy, and I call that method the 7 Principles of Healing Chronic Pain. Over years of training and research extra to my medical qualifications I found that healing can only happen when the body is given the correct conditions. No drug or physical therapy will heal chronic pain, the 7 Principles of Healing are what heals chronic pain and I explain them in full detail within my book, The Art and Science of Healing Chronic Pain – with Light. Dr. Mark Rogers has been a general practitioner for thirty years and developed his expertise in soft tissue injuries, chronic pain, and laser over the last twenty. A former migraine and back patient himself, he saw the need for a book specifically for patients and how to heal their pain. He has presented papers on his methods all over the world and lectures to post graduate Masters students. Three times nominated for Australian of the Year he lives in Adelaide, Australia, is married and has five children. Co-author Nike Azovas is the author of four books. Her novel, ‘The Eagle of Spinalonga’ was an international bestseller and was one of Amazon UK’s One Thousand Best Books of 2013. Trained in journalism, creative writing and business she lives in Greece and Australia, and has three children. 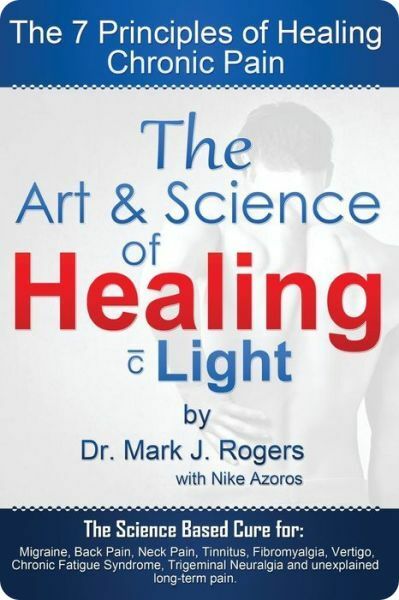 Their latest book is The Art and Science of Healing – with Light. Visit Dr. Mark J. Rogers’ website.